Do you want to change the type of massage of your jet, its look or simply find the same model? Air and water jets, air jets, jets for concrete hot tubs... You will find here a wide range of jets that fit all spas, as well as all the necessary parts for their installation. The the shape and the size of the rear element of the jet, which never change. The length of the jet. The diameter of the face is a much more secondary requirement, as the dimensions may vary according to the series within the same range. Tubs.fr gives you the dimensions and a profile view of the rear element for each jet. If your old jet does not match the same shape and size as the one found on our site, the latter will not fit into the socket installed on your spa shell. If you are not sure, look at the part numbers written on your old jet (if you can), or contact us ! 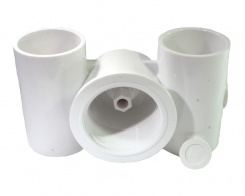 Finally, if you only have an opening in the shell of your hot tub, you will need the socket + jet assembly. Tubs.fr gives you all the available drilling diameters on our website, and therefore the corresponding water or air jet!